Successfully Added Haier Blender - 300 Watt Motor, Compact Size, 600ml Sports Bottle to your Shopping Cart. From smoothies to pesto to tomato sauce – this small yet powerful 300-Watt blender can mix almost everything. This Haier blender is specifically designed to cut, mix, and prepare small portions of your favorite soups, sauces, and smoothies. Its high quality PCTG plastic cup can hold up to 600ml at once - enough to mix several delicious cocktails for your friends or for a healthy breakfast shake. The plastic cup of the blender has furthermore been designed in an ingenious way – allowing you to simply replace the cutting blades with a drinking cap and so turning the plastic blender cup into a drinking bottle that holds up to 600ml. Next time you go to the gym you no longer have to worry about how to bring along your protein shake as now you can simply turn your blender into a portable sports bottle that can be easily carried around due to its small size and light weight. With its small and stylish design this powerful blender is a real catch to anybody who wants to impress their friends with an amazing cocktail during your next lady’s night, prepare delicious sauces and soups, or blend healthy shakes filled with nutrition. 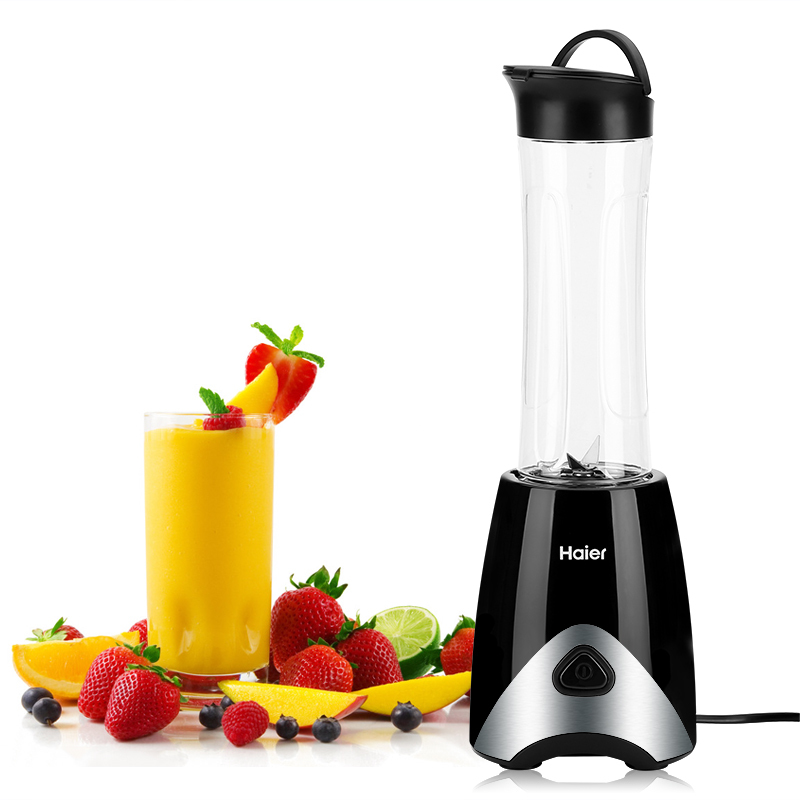 No matter what you use it for, this compact Haier blender will turn any fresh fruit or vegetable into a delicious drink or sauce. This Haier blender comes with a 12 months warranty, brought to you by the leader in electronic devices as well as wholesale electronic gadgets..